Cookies are not exactly health food, especially not if they’re really good cookies, as it is the combination of butter and sugar (and sometimes chocolate) that usually makes a cookie great. Cookies are supposed to be indulgent and, like most indulgent things, the low fat, low cal or otherwise “healthy” versions tend not to live up to the original. But this isn’t true of all low fat things and, when you find a good recipe that will cut some of the calories and fat from an indulgent favorite, it is worth hanging on to. 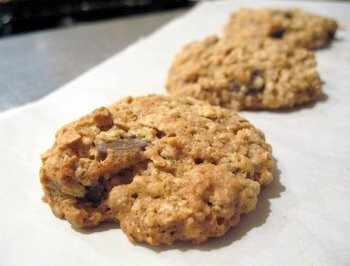 This recipe forÂ Low Fat Oatmeal Chocolate Chip Cookies is one of them. I’ve been making the same cookies for years and, while you wouldn’t mistake their chewy and moist texture for the buttery and crisp regular Oatmeal Chocolate Chip Cookies, they are stillÂ more than good enough to justify a second trip to theÂ cookie jar. Unlike many lower fat recipes, these do not skimp on is the amount of chocolate chips used in the recipe at all, nor do they use mini chocolate chips in an effort to make it appear as though the cookies have more chocolate than they really do. That being said, you can easily substitute raisins, dried cranberries, white chocolate chips or anything else into the cookie for the chocolate if you prefer. The only thing to keep in mind when baking these is that it important not to overbake them. Part of their chewiness comes from the fact that the applesauce in the dough keeps the cookies relatively moist and, if overbaked, they will become a bit dry. It is best to err on the side of caution and take them out a minute early if your oven is hot. Letting the cookies cool slighlty on the baking sheet should help them to finish cooking even when outside of the oven. In a large bowl, cream together the butter and the sugars. Beat in the egg, followed by the applesauce and the vanilla extract. Working by hand, stir in the flour mixture and the oats until just combined and no streaks of flour remain. Stir in the chocolate chips. Drop tablespoonfuls of the dough onto the prepared baking sheet, flattening each cookie slightly. Bake for about 10-12 min. Cookies will be light brown at the edges when done. I love oatmeal cookies and will try your recipe this week! Have you tried using whole wheat flour on these cookies? Maybe half all-purpose and half whole-wheat? (or white whole wheat flour) Do you think it might work? I like using whole grains as much as possible in my baking… I guess I will try something like that and will report back with my results! But let me know if you have experimented with this already! I have used white whole wheat, but not regular whole wheat. I would think that a combination of regular all purpose and whole wheat would work pretty well. If you do get a chance to try it, report back. I’d love to hear how it turns out! i am a big fan of oatmeal cookies and will definitely be trying my hand at a veganized version of this recipe. i might also consider using half whole wheat pastry flour. This is very similar to a recipe I use- they’re not quite the same as oatmeal cookies made the normal way (obviously), but very very good for low-fat cookies and great to have around for daily snacking. I’ve made them with part whole wheat flour, and that works pretty well. My favorite add-ins are dried cherries and dark chocolate chunks…yum. Thanks for your recipe. These taste like muffin tops…yummy! I love these cookies! I used regular oats & only 3/4 c. of chocolate chips & they still came out yummy! Has anyone doubled this recipe? I guess that replacing the white sugar with Splenda would be fine (and more low-fat), what do you think? My family and I tried this recipe and loved it… We double the recipe and they turned out wonderful… We gave this recipe a 10….. I just made these and they are great! After making and eating too many things that I know I shouldn’t (see my blog if you want) I needed to make something low fat to feel better about the snacking! These are great. I will keep baking full fat for others and use these for my snacking! Thanks–just what I was looking for! Love your site and check it daily. Oh, I used all whole wheat pastry flour and they were great! Darn it! I just took your regular oatmeal chocolate chip cookies out of the oven and NOW I find the low-fat version? Oh well. The regular ones were super yummy. I just used the 1/2 whole wheat 1/2 white flour. They are darker in color, but taste fine to me! My bf is going to be so excited when he gets home! The recipe looks great. I’ve been looking for a low-fat oatmeal choc chip cookie recipe calling for applesauce. Do you have the basic nutritional information (calories, fat, etc.) by any chance? If not I can calculate it. Thanks! I just made these this weekend for some friends and they almost ate all 2Â½ dozen of them!! They are perfectly chewy and taste amazing. I’m going to try them with raisins or dried cranberries next. i love them so much! These cookies are great! I made them for my halloween party and used 3/4C of pumkin instead of apple sauce and 1tsp of all spice, SO GOOD! I put a few chocolate chips on the top of some of them which was an added goodness! hallo! just would like to ask what i can substitute for apple sauce since i dont have one at the moment. i made these with whole wheat flour and they turned out good but pretty hearty. One cookie does the trick! Your recipe is fantastic. I varied the ingredients a bit – used sweetened dessert tofu instead of apple sauce and tried whole wheat flour. The results were fantastic. Your recipe is a great base for other great cookie ideas. Thank you. I’m wondering if I did something wrong… Our cookies (my little ones helped me bake) turned out salty. To answer another question…we did use half whole wheat flour and half white flour and that part was okay. Not sure why they are salty, though. That, and they fall apart easily. Maybe I just didn’t bake them long enough. I think this recipe would be okay otherwise. THESE ARE EXCEPTIONAL!!! THE BEST COOKIES I HAVE EVER MADE! THEY LASTED TWO DAYS IN MY HOUSE OF 5 PEOPLE WHEN I DOUBLED THE BATCH!!!!! YOU MUST TRY THESE, YOU WONT REGRET IT! a great healthy snack with 0 guilt! MAKE SURE YOU DONT OVER BAKE THEM. THEY SHOULD COME OUT MELTY AND CHEWY!!! MMMMM now that i talk about them I think i’ll have to make more! DELISCIOUS!! I WOULDN’T CHANGE A THING! This recipe is awesome! I changed things slightly and added 1 tsp of cinnamon, 3/4 cup of brown sugar (no white sugar) and 1/4 cup cocoa. The cocoa made the cookies fabulous! I would add less chocolate chips with the cocoa and cut the fat even more. (Cocoa doesn’t have a lot of fat.) I may try with half whole wheat/half white flour and only 1/2 cup sugar next time. These cookies are AMAZING!! Thanks so much for the tip with the applesauce. I am on a special diet because of food intolerances so I used 1 cup plus 1 TBSP Spelt Flour, 3/4 cup brown sugar and 1 cup dark chocolate chips. I will definitely be making these again and will double it next time! Thanks again for a terrific recipe that’s health conscious! The only thing I changed was substituting the chocolate chips for unsweetened chocolate powder. It’s so chewy and moist and I will definitely bake them again! What is the nutritional info for 1 serving? or cookie? tried the recipe- delish! maybe a tad bit heavy on the oats for my liking, but delicious none-the-less! added raisins only. Next time will add a few choc. chips. Is parchment paper necessary? Anyone tried them without it? Thanks for all the comments with adjustments to make them healthier! Can’t wait to try them. These were very good 🙂 I used whole wheat pastry flour and cinnamon chips instead of chocolate. They even passed the kid test! These were delicious! I substituted the white for wheat flour and used splenda as well as organic light brown sugar and whipped organic butter! They still turned out great =) and i like butterscotch instead of chocolate chips so i switched that up too. Made these cookies on a whim this afternoon and loved them! I even wrote about them on my new blog. 🙂 Love this site, too! I’m looking forward to exploring it more in the near future. Thanks for posting the recipe. The cookies have a great texture but they were a bit sweet for my taste. The rest of the family will be glad to eat them all though. I replaced the white flour with whole wheat flour then added dark chocolate & flax seeds and cranberries in it….delish! Hi, tried your cookie recipe tonight…Loved it !! Thank you for giving me a new favorite recipe. Cookies were soft and moist/chewy. Best of all they are healthy and low fat !! ….Just needed to add that I replaced the all purpose flour with organic white whole wheat flour and I used 1/2 the amount of chocolate chips !! Yummy =) !!! Doubling this recipe in the past left me with a dry mix and made rocks for cookies… so the single-batches work best. I’ve used organic sugar- splenda brown sugar and it works great!!! and white – whole wheat flour from trader joes. These cookies are an amazing substitute when wanting something sweet – but keepin that diet in check!!! My boyfriend and I love these cookies! I just made one change: I used 1 tbsp of butter (instead of 2 tbsp) and added an extra tsbp of applesauce. They were still fabulous. This is my first time to your site and I’m impressed. Thanks for sharing! Love them!!! Not having applesauce I have started adding some nonfat yogurt.. just about 2 spoons. I think it makes it even better! Also some walnuts and only 1 cup of oats. Very tasty! I dont have unsweetened applesauce i only have plain so i’m not sure if i would be able to make these. They sound great though!!! I’m considering using some non-fat yogurt but i don’t have plain yogurt only vanilla. Amazing cookies! Easy recipe and best to bake at 11 minutes. Used apple/mango unsweetened applesauce and it added a different tropical taste, amazing!